International bestseller: Kurt Wallander and his daughter join forces to hunt for a ritual killer in this "gripping, beautifully orchestrated" mystery (The New York Times Book Review). Linda Wallander is bored. Having just graduated from the police academy, she's waiting to start work with the Ystad police and move into her own apartment. In the meantime, she's staying with her father and, like fathers and daughters everywhere, they are driving each other crazy. Nor will they be able to escape each other when she moves out. Her father is Inspector Kurt Wallander, a veteran of the Ystad police force, and the two of them are about to find themselves working a case that couldn't be closer to home. Linda's childhood friend Anna has disappeared. As the investigation proceeds, she makes a few rookie mistakes that are both understandable and life-threatening. But as the case her father is working on dovetails with her own, something far more dangerous, and chillingly calculated, begins to emerge. 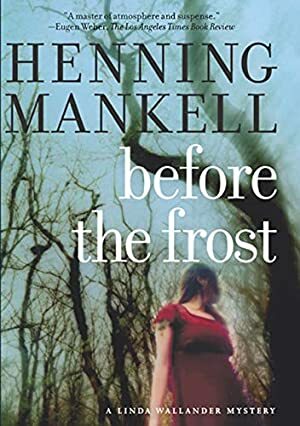 A "powerful" and "thoroughly engaging" thriller from "a master storyteller," Before the Frost introduces an unforgettable new heroine to the acclaimed series that is the basis for the BBC television show starring Kenneth Branagh (San Francisco Chronicle). Track It. This book has been $1.80 within the past year. Log In to track Ebba Segerberg on eReaderIQ. to be notified each time the price drops on any book by Ebba Segerberg. to stop tracking Ebba Segerberg. Log In to track Henning Mankell on eReaderIQ. to be notified each time the price drops on any book by Henning Mankell. to stop tracking Henning Mankell. We started tracking this book on July 23, 2011. This book was $8.13 when we started tracking it. The price of this book has changed 301 times in the past 2,827 days. This lowest price this book has been offered at in the past year is $1.80. The lowest price to date was $1.80 last reached on March 15, 2019. This book has been $1.80 2 times since we started tracking it. The highest price to date was $14.55 last reached on July 4, 2017. This book has been $14.55 one time since we started tracking it.